If it Ain't a Paint it Ain't! Subject: RE: Please pray for Chelsea Easley! Card info Pg 20 Pics Pg 21! Grits - 2010-09-18 3:37 PM Chelsea is doing great in rehab! 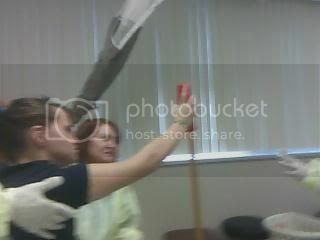 Here are a couple of pics that were taken of her during a therapy session on 9/17/10. Location: Haynesville, Louisiana The pictures are great!! Keep up the good work cowgirl!!! We're sending lots of love and prayers your way!! Location: Louisiana I will be going to visit Chelsea a week from today (Oct. 2), so I will have a firsthand update after that. However, I don't expect to be able to post any pics until I return from our trip Oct. 7th. There have been a few more donations coming in, and I will take those to Chelsea & her mom Sally when I go. Thanks again for all the help and prayers! Location: Haynesville, Louisiana Just wanted to let you know we are very proud of you and all your hard work. I know you must feel like your getting no where fast, but you've came along ways! Just keep up the hard work and you'll be riding soon!! I'm still keeping up with you on here and caringbridge. Keep up the good work!! You are doing great!! 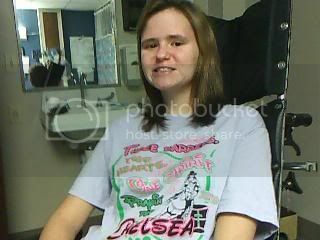 Location: BOSSIER CITY, LA Talked with Sally today she has been sick so havent been able to talk with her. She said Chelsea is doing ok but still cant eat by herself and is still not getting any liquids. She can brush her hair by herself and can take a few steps on her own. God is great. Location: OH. IO is Chelsea able to speak,does she understand what happened to her?Her progress is remarkable,im wondering also about Sallys funds for staying there,is she in need of help?Sorry for all the questions,this story really inspires me. Location: BOSSIER CITY, LA I have had a few conversations with Sally about this. Chelsea hasnt said what happened and they havent asked. I dont think she realizes how bad it was because she kept telling Sally she was going to die. Sally told her if the Lord wanted her she wouldnt have made it this far. My church had a fish fry fundraiser and raised $5500 to help with the housing, parking and incidentals while she is in New Orleans. I also know that another friend had a fund raiser and raised $3000 and the benefit barrel race is this Friday. Location: Louisiana Just look at Chelsea today! I am so happy to see her looking so good! Isn't this amazing?? I can't wait to see her and her mom this weekend! Thank you, Sonja, for sending the pics! WANNACOWBOY - 2010-09-28 6:49 PM I have had a few conversations with Sally about this. Chelsea hasnt said what happened and they havent asked. I dont think she realizes how bad it was because she kept telling Sally she was going to die. Sally told her if the Lord wanted her she wouldnt have made it this far. You and your church friends did an awesome job with the fish fry, and I know you worked your hiney off on delivering those fish plates! And don't forget the $1050 donated by the wonderful folks here at BHW. Location: BOSSIER CITY, LA You are right I didn't have the figures for the BHW people and knew you would add them to my post. lol I feel blessed to be able to experience this MIRACLE with my barrel racing family on this site and cant wait for your firsthand update this weekend. Thanks to everyone for all the prayers, cards and donations.